For the proposals in City of Melbourne’s discussion papers to be described as “radical” and “ridiculous” just shows how far we haven’t come in transport planning in this state. Perhaps it’s no surprise given that in the forthcoming election, if choosing a major party, we vote for either the mob who wants to build two massive motorways, or the mob who wants to build three massive motorways — the latter announced on a day of heavy smog, and despite Melbourne already having more motorways than most cities of its size. Nowhere in the City of Melbourne discussion papers did they suggest outright banning cars in the CBD. And I think that would be a bridge too far; the Hoddle Grid is a far bigger area than any car-free central city areas around the world, and it would cause headaches for vehicles that have to be there, such as for deliveries. But it’s blindingly obvious that in a central business district where the majority of people arrive and travel around without a car, that it’s time to stop allocating the majority of road space to a diminishing number of motorists. Central cities are, by their nature, space constrained. Inner Melbourne is getting busier, with daily population expected to climb from almost a million now, to 1.5 million in the coming years. So reducing space for motor vehicles, and discouraging motorists from coming into the CBD isn’t radical or ridiculous – it’s just commonsense. Although the discussion paper is a long way from being City of Melbourne policy, it’s refreshing to see recognition of the issues. Re-allocating a traffic lane and/or parking spaces to pedestrians and cyclists would be a big improvement. More separated cycling lanes and wider footpaths would be a win for the most efficient modes. Queen Street and Lonsdale Streets should probably have 24/7 bus lanes implemented, given these are major bus corridors. Optimising traffic lights is an obvious one. 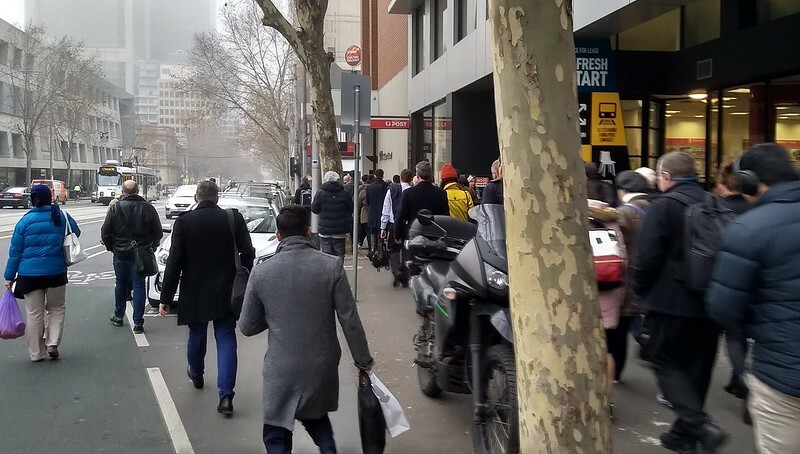 King Street’s dominance of light cycles in particular, is absurd, delaying east-west flow for pedestrians heading to/from Southern Cross Station, and trams. But it’s also a problem at other intersections, including William/Bourke. In fact the lights along Bourke Street are all over the place, playing havoc with the trams. Motorcycle parking has long been a bugbear of mine. 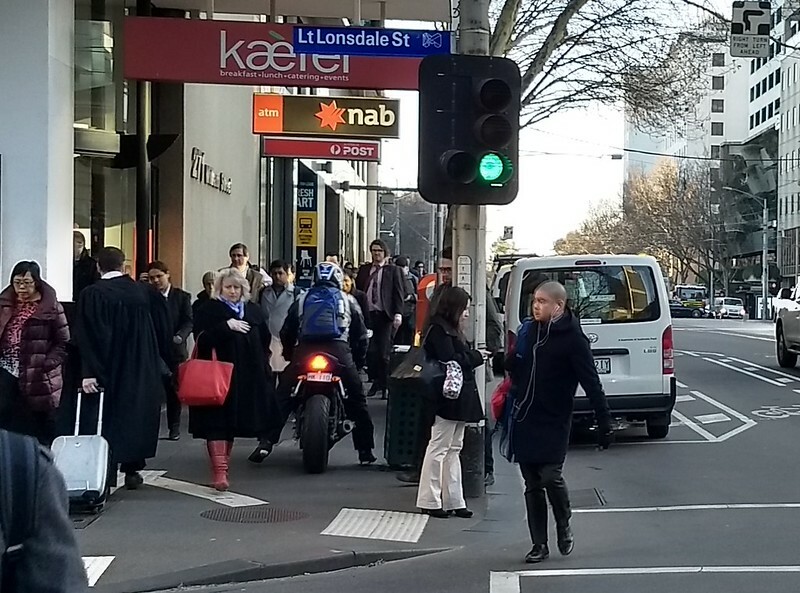 Given almost every person coming into the CBD is a pedestrian at some point during their visit (even those who drive), but journey to work mode share for motorcycles is just 0.7%, it’s ridiculous that these motor vehicles take up so much space on footpaths, with only unenforceable guidelines to stop them completely taking over. 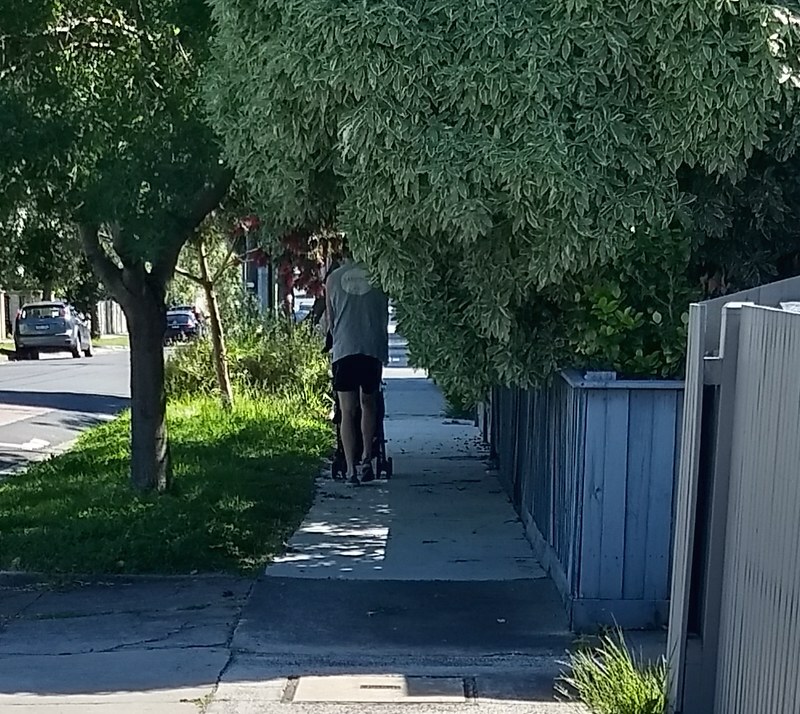 Assuming we don’t align ourselves to every other state in Australia and ban footpath motorcycle parking outright, they should at least be restricted to designated areas where they won’t impact pedestrian flows and can be manoeuvred on and off the road without conflict. Walking is probably the most neglected transport mode. Even worse than buses. It’s the most space-efficient, but increasingly squeezed for capacity as pedestrian numbers grow. Let me put forward a modest, simple proposal: The busiest parts of the city centre should have Pedestrian Clearways. 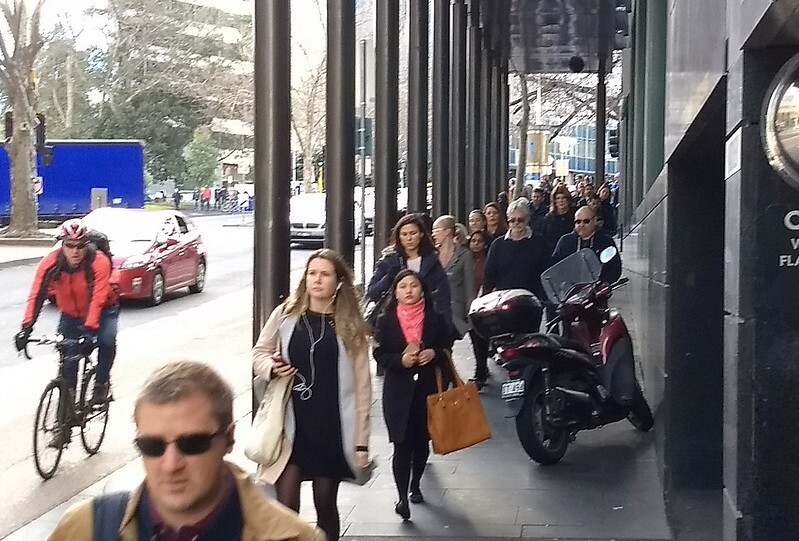 There’s a great opportunity to ease crowding on our CBD streets. In a constrained space like the city centre, encouraging more people to walk and use public transport can only be a good thing. But you can’t just wish for improvements. It’s high time authorities acted to prioritise pedestrians. Lots of people usually alight at my station, even late at night. But as we all exit and walk off in different directions, the streets, especially at night, can get pretty quiet very fast. The awful murder of Eurydice Dixon has got us as a society once again talking about personal safety issues. While it’s true the risks are actually greater at home among people we know, there are obviously some dangers out in the world. 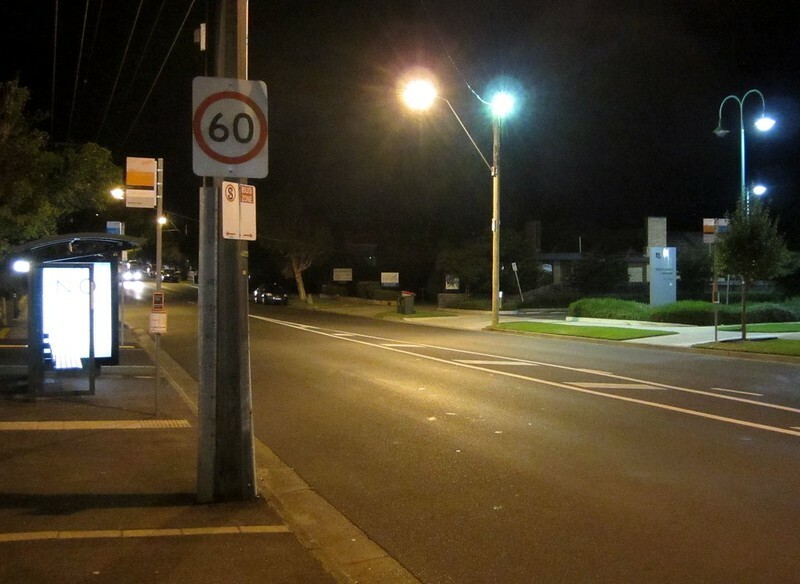 One article that caught my eye was this piece in The Age, about walking home in the dark. I get off the train in the darkness, and see a woman. She is smaller than me. Most are. She strides with purpose – upright, head on a swivel – seemingly alone, with only her “situational awareness” for company. She would have seen me, too. I’m the big stranger behind her, leaning into the wind, dressed all in black – boots, hat, coat, with a beard. She moves quickly, but in the same direction I’m headed. In the hurry to get home and see my wife and little boy, I could breeze by her, quickly closing the gap between us until my long strides overtake her short ones. I could fall into lockstep with her brisk pace, following from a short distance away. I could bolt past, if I wanted. But I don’t. I haven’t done any of those things in a long time. These days I stand and wait a few moments, to create a comfortable buffer. Or I choose an alternate path home. Or I call someone on the phone, hoping my voice engaged in light conversation might dispel any sense of troublesome disquiet that my silence might otherwise stir. But this is an important reminder that also there are things us blokes can do to ensure our presence is not intimidating to others. I recall many years ago, when I was about twenty, reading a letter in a newspaper on this topic. The female author was thanking an unknown man — she had been waiting at a dark lonely railway station late at night, and he arrived to catch the same train. She noted that where and how he entered the platform to wait nearby, and his body language, appeared to be deliberately non-threatening. When walking at night or in an unfamiliar neighbourhood, your own personal safety means it’s often better to convey a sense of purpose, and that you know where you are going. But beyond that, there are things you can do to avoid being unnecessarily intimidating to others around you. Not just women — anybody who might consider themselves vulnerable to others. Kids on their way to school. Anybody walking alone when you’re in a group. Anybody smaller than you. Everybody’s got a right to be out there on the street. It’s not Might Equals Right. Don’t walk directly behind someone. 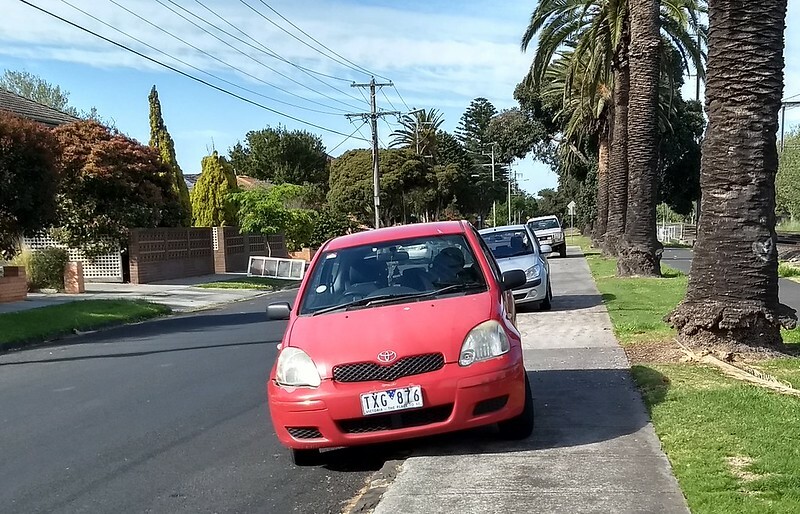 Back off, or overtake quickly — perhaps at a spot where the footpath is wider so you don’t get too close; or cross the street. It seems to me that even little gestures of body language might help put the other person at ease. If walking in the opposite direction, by all means acknowledge, but don’t stare. Even bow your head slightly to stare instead at the pavement is likely to give off the signal that you’re not a threat. Some of the reactions to the Age article have been interesting. One (female) letter-writer suggested men should call out offering help, even if everything seems fine. I’m inclined to think that’s just going to be perceived as creepy. Some responses have just been grumpy, and selfish: What should men do? Are you kidding me? Nothing is the answer. Why? You are in charge of your own safety, not men. Why? Because we live together in a society, that’s why. It’s not Every Man For Himself. We can work together to help each other; to make our spaces safer and more enjoyable. One of the joys of living in a city is random helpful interactions with strangers. Open a door for someone; give a lost person directions; pick up and pass back something someone has dropped or left behind; volunteer some water for someone who needs it; even just standing on the left of the escalator. I just watched Hannah Gadsby’s “Nanette“, just released on Netflix. It’s excellent, compelling viewing. I won’t give away the ending, but there’s a marked change of tone towards the end, and one thing she discusses is people’s humanity. Having consideration for others, helping (and being helped by) strangers — it’s not just the right thing to do. If you don’t have these random happy moments in your life, you’re missing out. 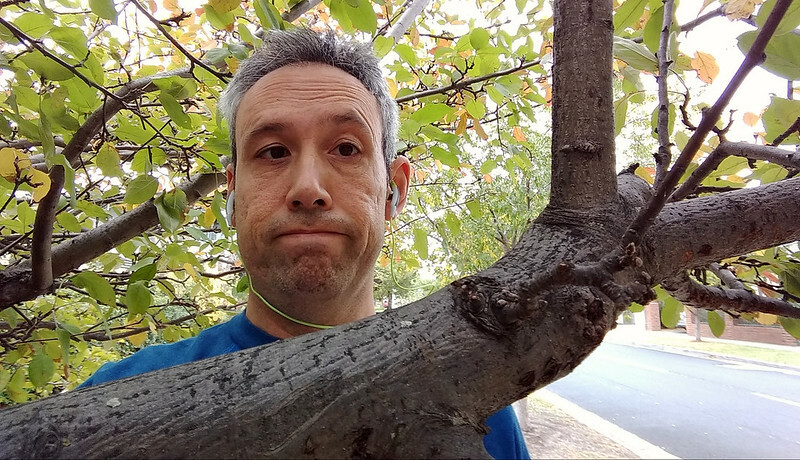 I ran a Twitter thread over the last fortnight, highlighting some of the ways that footpath space is misused, or mis-allocated. This blog expands on those posts. In some of these cases, capacity constraints are causing problems for large numbers of pedestrians. Able-bodied people are often able to avoid those hazards, though it does slow them down. More seriously, for those with limited mobility, such as those in wheelchairs, these issues can cause real problems for people just trying to get out and about. 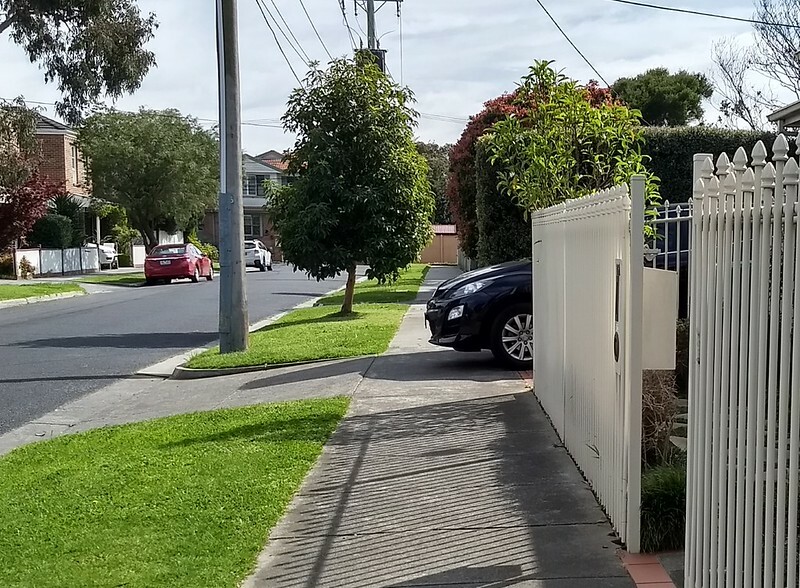 Placing advertising sign/s or displaying any goods on a Road (including a footpath) or Council Land unless permitted under the Glen Eira Planning Scheme. Owning or occupying a Property from which trees, plants, shrubs or any other thing overhang or encroach on any Road (including footpath) at a height of less than 3 metres or from which a gate obstructs any Road or footpath. 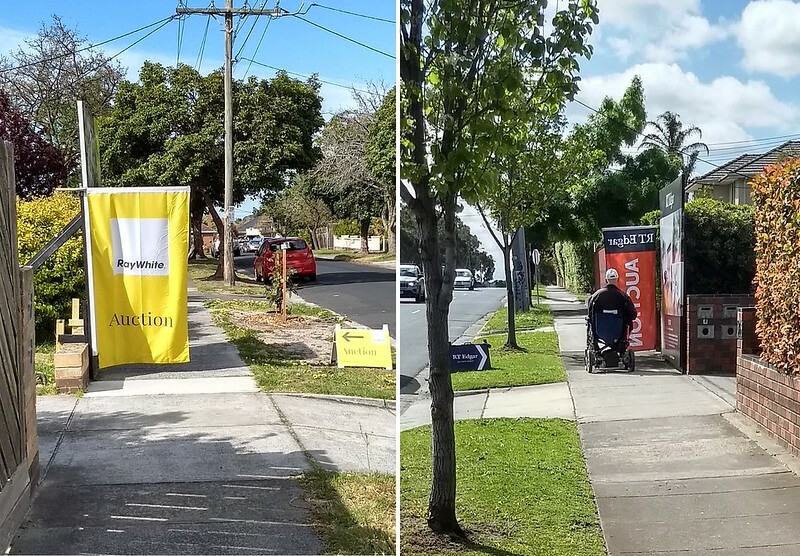 Typically if you ask a real estate agent on Twitter why their banners are blocking the footpaths like this, they’ll invariably say they’re investigating, and ask for details of the specific property, as if it’s some unique occurrence. It’s not of course. It’s a style of banner that is widely used. There have been occasional prosecutions for this — perhaps there need to be a few more so the real estate industry starts adapting. Some have found a solution: a smaller banner that is clear of pedestrians (though probably not 3 metres above the path). 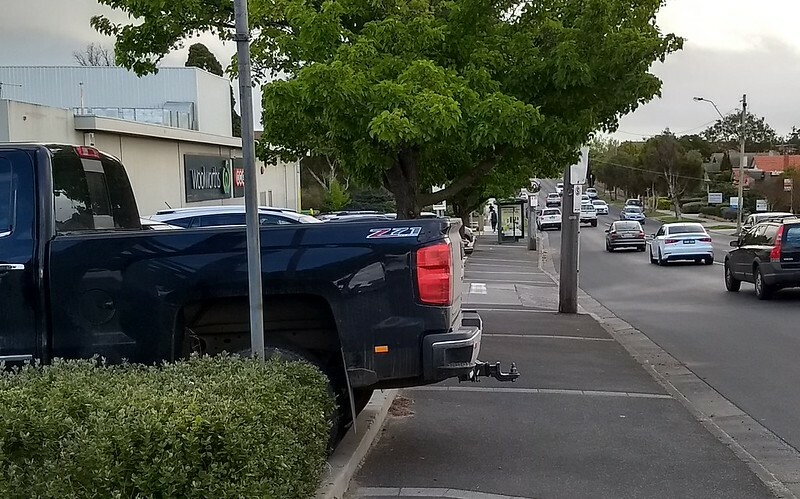 Motorcycle parking on footpaths is legal in Victoria — a situation that is unique in Australia. In this post from 2013, I looked at the guidelines (which are not enforceable) and asked the obvious question: are the laws actually appropriate, particularly in busy city centres? One can argue that motorcycles are more space-efficient than cars. Not if they encroach onto footpaths they’re not. City of Melbourne’s 2012 transport strategy paper on “Flexible and adaptive private transport” estimates that just 1-2% of trips to the City are by motorcycle. From how they take over vast areas of footpath in some areas, we should be thankful it’s not any higher. The paper identified this Action (number 42): Increase the supply of motorcycle parking in congested areas to reduce the need to park on footpaths and prohibit motorcycle parking where it obstructs walking, or other complementary activities. Sounds good, but as far as I know, the short list of three locations in the CBD where motorcycle parking is banned in 2017 is exactly the same as it was in 2001. 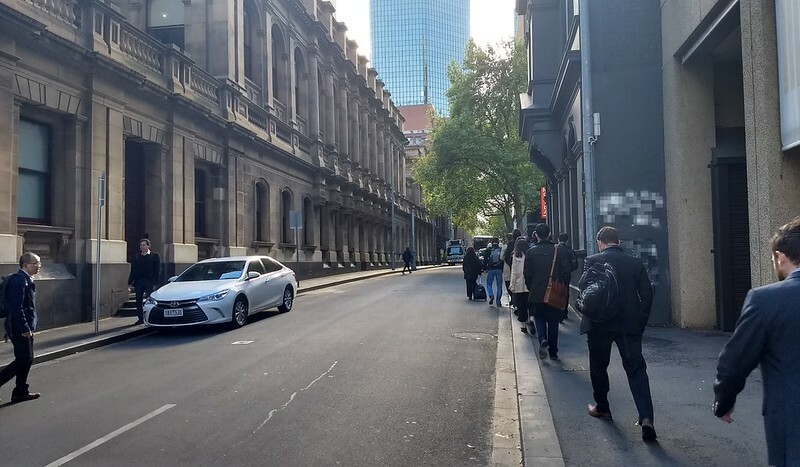 Footpaths like this are found right along most of the Little streets in Melbourne’s CBD: one lane of traffic, two lanes of parking, and two narrow footpaths for pedestrians, despite them being in the majority. I’m guessing the street has been this way for a long time. Doesn’t mean it still should be. 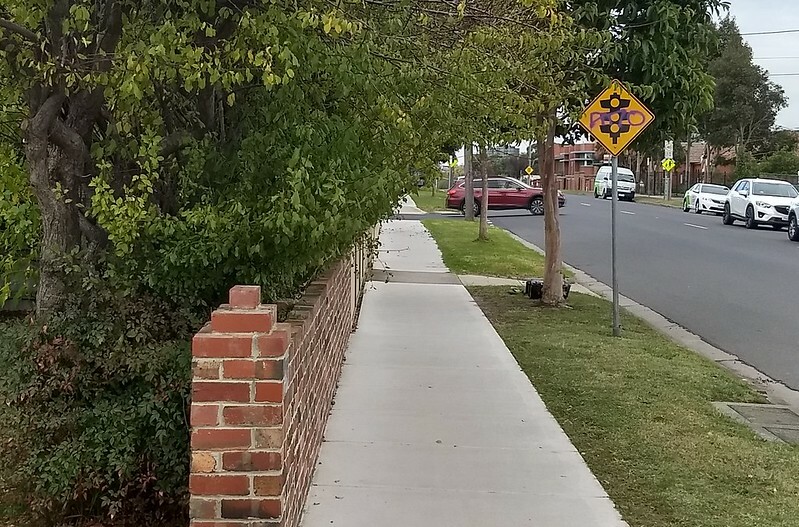 And with City of Melbourne progressively replacing footpaths with bluestone, there’s an opportunity to re-allocate space in favour of the most space-efficient, most desirable mode. Priorities, right? 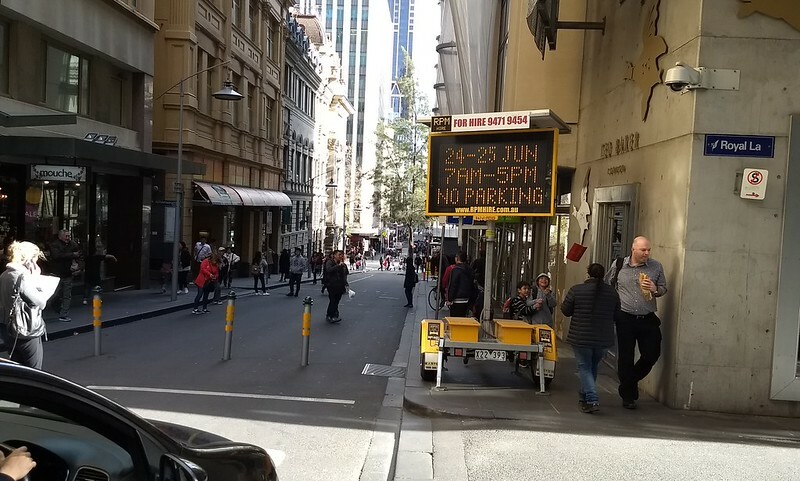 Recently there have been calls to make Chinatown car-free, at least at some times of day, but throughout the CBD there’s a good argument for reducing parking and widening footpaths to cope with crowds and encourage more walking. Another common sight where car parks are adjacent to footpaths, including 90-degree street parking. Someone with limited eyesight who didn’t spot this huge vehicle sticking blocking half the footpath could do themselves a serious injury. Education of motorists could help, but a design change to prevent this type of overhang would be better. Possibly this is illegal under the same laws quoted above; it’s not really clear. This one was first spotted by Victoria Walks. Notice how the road is blocked anyway — though this is a temporary (every lunchtime) measure. Certainly though the roadway is wide enough that it could accommodate the sign plus traffic. was not ideal, it was not appropriate to locate it on the carriageway, taking up a parking space, as it would affect the servicing requirements of abutting properties within this limited parking area. They also acknowledged that they only left 1.1 metres of footpath clear, narrower than the recommended clearance of 1.2 metres to allow for wheelchairs. So there you have it. As far as City of Melbourne goes, parking in the middle of the CBD is more important than footpath users, including those in wheelchairs. And that includes when it’s a sign to advise of No Parking! This is pretty common in the suburbs. 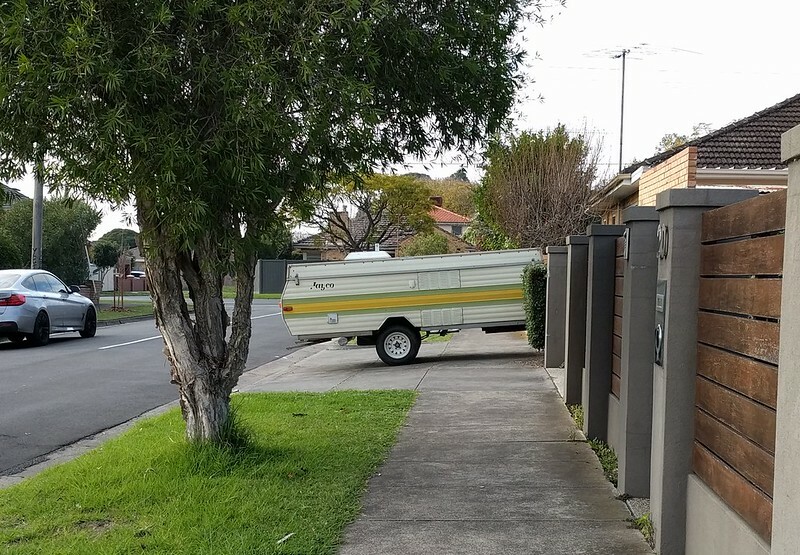 Some motorists think their driveway includes the footpath. It’s possible to dob people in for this. In the past some have been issued with fines. But more widely educating might be a better start. Glen Eira have publicised it in their regular newsletter, but given how common it is, more is needed. 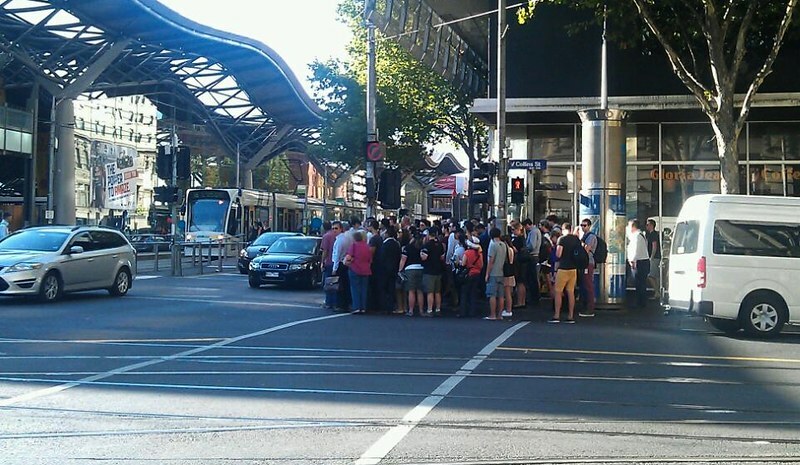 This is just south of Flagstaff station, one of the busiest pedestrian locations in Melbourne. It’s not just that the motorcyclist is parking on the footpath; it’s also that he needs to ride it from the nearest ramp. Thankfully he was doing so slowly, walking it (even though he’s sitting on it)… apparently undeterred by the swarm of pedestrians coming towards him. The bigger problem is that, this footpath is so busy that City of Melbourne have an automated pedestrian counting device to monitor it, and pedestrians regularly walk on the road to avoid obstructions. Despite that, no action has been taken to simply ban motorcycle parking along here. As per number 2, the ban locations haven’t changed since 2001. Given the explosion in growth in the CBD, that’s just ridiculous. Meanwhile in the burbs, this is happening. For someone with a pram or mobility aid, the choice is try and get past on the grass (and hope you don’t get bogged down) or use the parallel cycling path — not ideal. Similar to number 6, though trailers and caravans seem to be even more of a blind spot for some owners. Common in some outer-suburbs, but also a problem in Glen Eira. 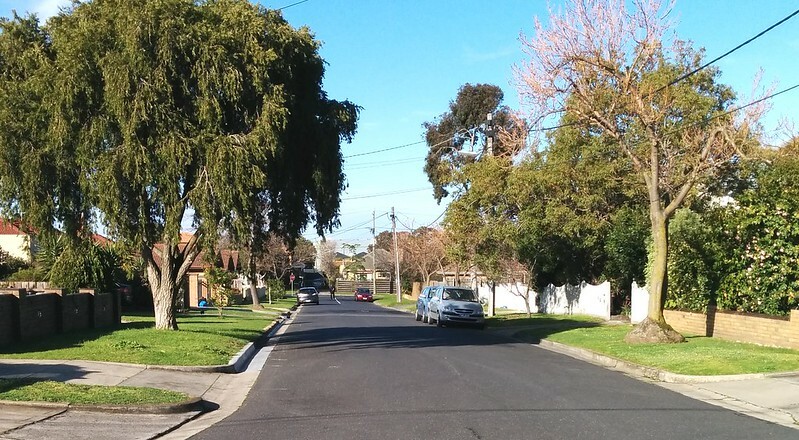 There are a number of streets around Bentleigh and East Bentleigh with no sealed footpath at all. Pushing a pram? Or you have wheeled luggage? Or in a wheelchair? I guess you just use the roadway and hope a car doesn’t zoom around the corner and skittle you. Why this persists I have no idea, though I’m told City of Glen Eira at least is moving to address it. Refer to the council laws quoted in number 1. These are meant to be maintained to leave clearance of 3 metres above the path, which would allow plenty of space, even for an adult on a bicycle (legally on the footpath if they’re supervising an under-12). The couple pictured above (they’re walking in single file) had to manoeuvre around the bushes to get their pram past. Lucky the weather was dry so the nature strip was okay. How would someone in a wheelchair go? Onto the grass or cross the street I suppose. Most of us were born with two feet to walk around. But those who choose to walk, rather than drive, are constantly marginalised, by poor planning, and poor regulation. The built environment, and the way some people are allowed to misuse it, actively discourage walking. This is despite the numerous benefits to personal health, as well as society at large, from more people walking instead of driving. If they want to encourage people to walk, they should at least ensure it’s as easy as possible. But in many cases, traffic lights are programmed to make it difficult – even where fixing it wouldn’t disadvantage motorists at all. Here’s the T-junction at Centre Road and Eskay Road, Oakleigh South. I’m walking along Centre Road, crossing Eskay Road. It’s a quiet street with virtually no traffic – so by default the traffic light is green for Centre Road traffic. But not for pedestrians. Pressing the button has no immediate effect. The signals stay as they are… for over a minute. 80 seconds later, the green man suddenly pops up. Governments spend millions trying to cut car commutes by a few minutes. Meanwhile, this deliberate decision by whoever programmed the traffic signals makes people wait 80 seconds for no reason. I suspect the signals are programmed to wait and see if a car on Eskay Road triggers the sequence giving green for them, which would then provide a green man in the next cycle for Centre Road. But because no car turns up, eventually it gives up and just gives the pedestrian the green man anyway. By the way, this is next to where the Vicroads office used to be. Treating pedestrians like this is the perfect way to remind people coming on foot or from the bus (say, to apply for a driver’s licence) that they should have driven instead. This is not a once-off scenario. Further west down Centre Road, I found an identical situation outside the Moorabbin Hospital (in East Bentleigh). This one “only” made me needlessly wait 40 seconds for a green man. Okay, so maybe this is a problem with old installations. Vicroads are doing some good stuff with priority for pedestrians, cyclists and public transport, but I’ve heard that there are issues with getting enough qualified staff to be able to re-program old traffic lights. So brand new traffic lights would be much better, right? Well, here’s a brand new set. Oakleigh Road and Grange Road in Ormond. Installed earlier this year. I’m walking along Grange Road, which gives traffic the green by default, and crossing Oakleigh Road. This was always a hairy intersection for drivers going straight or turning right from Oakleigh Road. Ditto, pedestrians crossing Grange Road. So it will bring undoubted safety benefits. But it has made things far worse for pedestrians walking along Grange Road. The lights don’t wait for a while to provide a green man, as in the above examples. Instead, they switch to giving a green to Oakleigh Road — which doesn’t have any traffic at the time — then switch back to green for Grange Road, with the green man. Yes, these traffic lights prioritise non-existent traffic over pedestrians. Why should I even need to press a “beg” button? Why don’t traffic lights provide an automatic green man? It’s possible. It’s used in the CBD, and in some suburban shopping areas, as well in areas with large Jewish populations on the sabbath. Okay, so sometimes the traffic sequence might be too short to easily provide a green man. But why can’t they at least provide it when it is long enough, particularly in situations as shown above where one road is the default to get the green for traffic. Motorists usually don’t have to stop and “beg” and wait. In some cases they have to trigger a sensor in the road to get a right turn arrow or a green from a minor street (as above), but this is the exception rather than the rule. Maybe there’s not the political will to give pedestrians higher priority than cars, especially in the suburbs. There should be, to encourage more walking, but there isn’t. So how about at least not treating pedestrians with contempt?